Tiger is the prime predator and a species that sits on top of the food chain. Its role in nature is to control the population of prey animals and maintain a healthy balance. A Tiger kills, at an average, once every week and between 50-60 times a year. If there were no Tigers, the prey populations will increase beyond control and in the long run these herbivores will impact the plant composition of the jungle. This will affect all components of the jungle like insects, birds, reptiles, fungi, micro-organisms and the whole chain of nature will come apart. To the untrained eye, the jungle will still be green but the 'Spirit of the Jungle' will be missing. The closest living relatives of Tiger are Lion, Panther (Leopard), Jaguar and Snow Leopard. Tiger has one of the widest distribution ranges among the big cats. It ranges from the arctic regions of northern Asia to Indian subcontinent and south-east Asia. There have been nine subspecies of Tiger in the modern times. Out of these three subspecies have become extinct in the last century. All the surviving subspecies are threatened by poaching, illegal trade of Tiger body parts, ever increasing man-animal conflict and shrinking habitat. Siberian Tiger Panthera tigris altaica: The Siberian Tiger is the largest living cat on the planet. They occur in far-eastern Siberia and north-eastern China. South China Tiger Panthera tigris amoyensis: This is the most endangered race of Tiger with no confirmed records from the wild in last quarter of a century. The entire population of 60-70 animals is restricted to captivity. This is also one of the 10 most endangered animals in the world. Bengal Tiger Panthera tigris tigris: This subspecies occurs in India, Nepal and Bhutan and Bangladesh. It is one of the most common race of the Tiger. Indo-Chinese Tiger Panthera tigris corbetti: The distribution range of this subspecies of Tiger is from China to Burma, Thailand, Vietnam, Cambodia and Laos. Malayan Tiger Panthera tigris jacksoni: This newly discovered race of tiger is restricted to Malay peninsula. 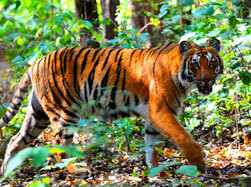 This small population of less than 500 animals was not considered a separate race till 2004 when it was split from the Indo-Chinese Tiger on the basis of DNA analyses. Sumatran Tiger Panthera tigris sumatrae: Restricted to the island of Sumatra, this is the smallest form of Tiger. Caspian Tiger Panthera tigris virgata : This subspecies of Tiger was found in the areas west and south of Caspian Sea and into east, all the way through central Asia till the Takla-Makan desert of China. This Tiger has been recorded in the wild as recent as early 1970s. Javan Tiger Panthera tigris sondaica : This Tiger was found exclusively on the island of Java and became extinct in 1970s. Bali Tiger Panthera tigris balica : This subspecies of Tiger was found exclusively on the island of Bali. It was hunted to extinction. The last animal, a female, was killed on 27th September 1937.